Appearing before the House Budget Committee, Deputy Defense Secretary Paul Wolfowitz publicly contradicts General Eric Shinseki, the Army chief of staff, for saying that it will take “several hundred thousand soldiers” to successfully occupy Iraq (see February 25, 2003). Greeted as Liberators - Wolfowitz says: “We can’t be sure that the Iraqi people will welcome us as liberators, although based on what Iraqi-Americans told me in Detroit a week ago, many of them—most of them with families in Iraq—I am reasonably certain that they will greet us as liberators, and that will help us to keep requirements down. In short, we don’t know what the requirement will be, but we can say with reasonable confidence that the notion of hundreds of thousands of American troops is way off the mark.” Wolfowitz says there’s no “record in Iraq of ethnic militias fighting one another.” [CNN, 2/28/2003; Isikoff and Corn, 2006, pp. 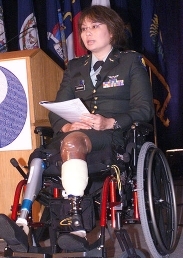 194] He restates the opinions of the top civilians at the Pentagon that it will take somewhere around 100,000 troops to secure postwar Iraq. Wolfowitz’s statement is echoed by Defense Secretary Donald Rumsfeld, who says, “The idea that it would take several hundred thousand US forces I think is far off the mark.” Neither Rumsfeld nor Wolfowitz mention Shinseki by name, but the connection is clear. 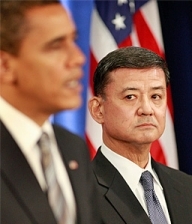 A spokesman for Shinseki, Colonel Joe Curtin, says that Shinseki stands by his judgment. “He was asked a question and he responded with his best military judgment,” says Curtin. 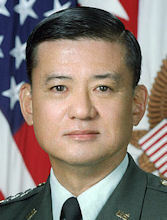 [New York Times, 2/28/2003] Shinseki will retire shortly after the contretemps with Rumsfeld and Wolfowitz (see June 13, 2003). CBS graphic illustrating interview with General Anthony Zinni. 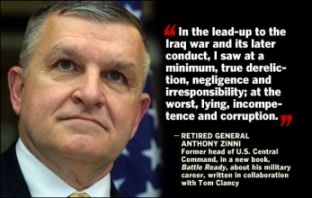 [Source: CBS News]Retired Marine General Anthony Zinni was the chief of the US Central Command until 2000, and, until just before the invasion of Iraq, the Bush administration’s special envoy to the Middle East. 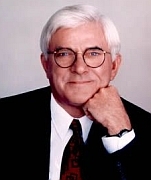 Now he has become an outspoken critic of the administration’s war efforts in Iraq. Zinni gives an interview to CBS’s 60 Minutes, in part to promote his new biography, Battle Ready, co-authored by famed war novelist Tom Clancy. Much Larger Force Required - Zinni was heavily involved in planning for any invasion of Iraq, going back to at least 1999 (see April-July 1999). Zinni always envisioned any such invasion as being implemented with enough ground forces to get the job done quickly and cleanly. Rumsfeld had different ideas—the invasion could be carried off with fewer troops and more high-tech weaponry. 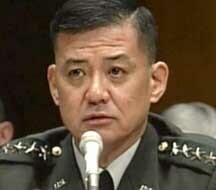 Zinni wanted around 300,000 troops: “We were much in line with General Shinseki’s view. We were talking about, you know, 300,000, in that neighborhood.” Would a larger force have made a difference? Kroft asks. Zinni replies, “I think it’s critical in the aftermath, if you’re gonna go to resolve a conflict through the use of force, and then to rebuild the country.” Rumsfeld should have anticipated the level and ferocity of violence that erupted in the aftermath of the toppling of the Hussein government, but, Zinni says, he did not, and worse, he ignored or belittled those such as Shinseki and a number of foreign allies who warned him of the possible consequences. 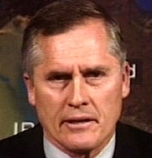 Instead, Zinni notes, Rumsfeld relied on, among other sources, fabricated intelligence from Ahmed Chalabi and his Iraqi National Congress (see September 19-20, 2001). Changing Course - Zinni has a number of recommendations. He advises President Bush and his senior officials to reach out much more strongly to the United Nations, and to US allies, and secure the UN’s backing. Do these other countries “want a say in political reconstruction? Do they want a piece of the pie economically? If that’s the cost, fine. What they’re gonna pay for up front is boots on the ground and involvement in sharing the burden.” Many more troops are needed on the ground, and not just American troops, he says, enough to seal off the borders, protect the road networks.